When I was little, my mom used to lay a blanket out in the yard for us and now it's one of my favorite things to do with my little guys. 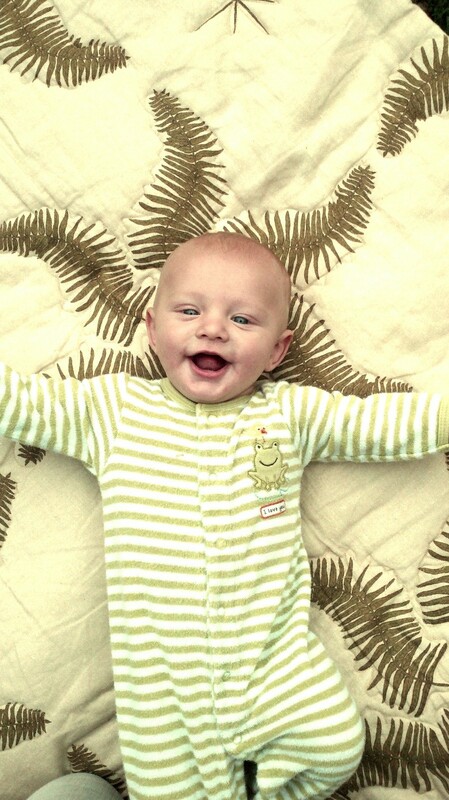 I couldn't resist putting Luke's head in the center of one of the fern stars on the quilt and taking some pics. It's definitely the little things & it's in the moments where I'm thinking of nothing else but that moment that I feel the most connected to & invigorated by life. girl i totally know what you mean about craving some "good" food. we are currently somewhat homeless and its hard to make a healthy meal without a true kitchen... i've had more than my share of fage yogurt cups, cereal, and granola bars. thankfully, i'm due to be moving into our new (old) home in only a few weeks! first stop: grocery store! "it's definitely the little things & it's in the moments where I'm thinking of nothing else but that moment that I feel the most connected to & invigorated by life"
I SOOOO agree! The weekend was beautiful and I am so happy you and your family had a moment of rest and relaxation! This is such a great pic of cutee pie luke! I love how carefree babies are, and by reading this post, I'm guessing you feel the same way right now! Happy for you! First off, he's soooo adorable Lauren! What a happy guy!! I think God made babies to remind us that the little things are all we really actually need. Everything else is icing on the cake. But it looks like you have a lot of awesome icing, like that quilt! With your gorgeous fabric! I'm so glad you got a chance to relax a bit and enjoy it al! You are so right about the little things in life...what a fabulous way to spend the weekend, hanging with your family. Love this photos of Luke! Your Baby is absolutely Precious!!! Luke is so beautiful. I really seriously want you to have one for me. Yours and Dave's offspring are gorgeous! Don't stop at 3! So cute - this looks is "glad to be alive!" Lauren- Beautiful photo - Luke is just darling! Looks like all is going wonderfully in your life. Luke is the cutest little guy and I know he's a STAR!!! Happy baby, new house and everything!! must say the two of you "create" the most beautiful children together! luke is gorgeous!